You all remember the client with la fiorentina drapes? 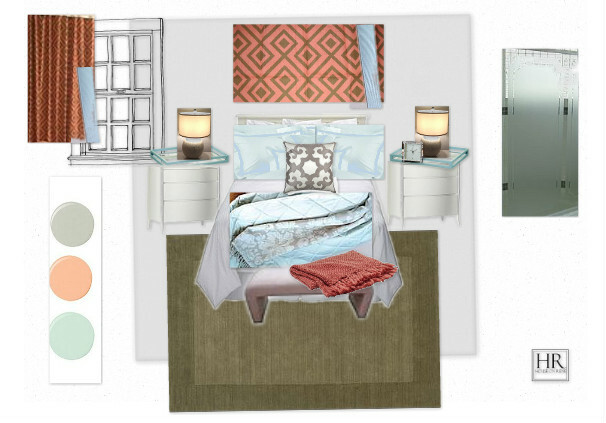 She needed some help with some finishing touches to her room and having it all make sense. There were a lot of items in the room that needed to stay and we needed to find a way to link these items together. Here is the board I put together to address these issues. The color palette was already there in the room, coral drapes, blue bedding and her furniture a very light gray. Now to make it all work together. Her existing bedding was an beautiful blue with a traditional damask pattern on it. We needed to somehow link this to the existing drapes and roman shade behind her bed. I found this graphic pillow from zgallerie that referenced the curves found in the damask but the extra large scale made it more modern and graphic, like the pattern in the drapes. The paint color I suggested is Tundra by Benjamin Moore. It is a soft light gray with a hint of blue. Trimming the drapes and roman shade in a ribbon that coordinated with the color in the bedding would help connect these items. I also suggested trimming some of her pillows in the ribbon as well. The etched decal on the side is to cover some existing mirrored closet doors. It repeats the molding pattern she has on two closets in the space. This was an inexpensive alternative to completely replacing the door. Finally, since everything else in in the room is rather light and airy, we have a rug in the same olive brown shade as the graphic pattern in the drapes to ground the room. It seems like she loved the ideas because look at this sweet email I got from her! Annie, you have some fabulous ideas for this room. I am so happy to be working with you. I realize this is a challenging project because of all the existing constraints. It's a lesson learned for me--how finding just the perfect piece of whatever can be the turning point in a complicated job--in this case, the graphic pillow that brought it all together. These are such great ideas, Annie. Love the pillow and the idea of trimming the pillow and drape in the blue is perfect...happily following you!! Thanks! I had a lot of fun! Thanks Janell, I appreciate your comments! What a wonderful email to receive! Doesn't that just make all the hard work worthwhile???!!! I love the color scheme! It really was a great email to get. I was so happy to have a small part of making her house a home. Thanks so much for your comments Traci!